We’ve been seeing some beautiful artichokes at the Hollywood Farmers’ Market these past few weeks, and while there is nothing better than farm-fresh artichokes, they can be quite a bit of work to prepare. 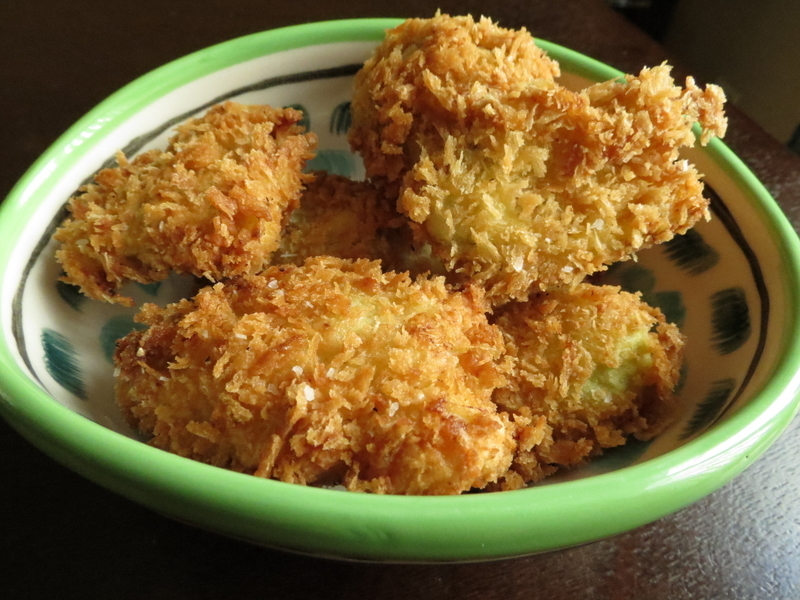 If you’re looking for a quick and easy appetizer, look no further than these Panko-Crusted Artichoke Hearts. Since I highly doubt anyone has the time to gut over a dozen artichokes just for their hearts, I recommend using good quality canned artichokes which are available at most grocery stores. For this recipe, avoid hearts that are marinated or are sitting in oil; you’ll want the simplest artichokes you can find– preferably whole canned or sealed in a glass jar in water or a salt-water brine; organic if possible. If using artichoke hearts that are in a salt solution, really make sure you give them a good rinsing as they can be a little on the salty side. Frozen artichokes also work, but I have found that many flash frozen brands yield an undesirable texture and are more likely to fall apart when defrosted. You’ll need to defrost frozen artichokes in order to dry them and coat them in batter. This recipe is great for entertaining. It’s also a good change of scenery for meatless po’boy sandwiches or even artichoke parmigiana. And since we’re using canned artichokes for this, you’ll be able to make this dish all year-round. Note: Since 99% of all domestic artichokes come from California, it’s not difficult to find locally canned or bottled artichoke hearts for those looking to keep their produce local. Whichever you choose, just be sure to stay away from any canned produce that has any scary sounding preservatives; salt, water, and citric acid are what you’d typically see on a decent canned variety. What you’ll need: Heavy-bottom frying pan or deep cast-iron skillet. 1. Place artichoke hearts in colander and drain. Rinse gently then lay on paper towels to dry (10 minutes). Be sure to rinse well to remove excess salt. 2. Combine flour and seasoning in shallow bowl and set aside. Place panko in another shallow bowl. 3. Pre-heat skillet with 1 inch of oil to 350 degrees. 4. With a sharp knife, cut artichokes in half lengthwise making sure to keep artichokes in tact. Dredge with flour, dip in egg, then cover with panko breading. 5. Working in small batches, fry artichokes in oil until browned (about 1-2 minutes). Use tongs to turn artichokes for even cooking. 6. Remove when golden brown and drain on paper towels. 7. Serve warm with lemon aioli. *For the lemon aioli, take a shortcut by using 1/2 cup of freshly made mayonnaise (recipe here) or organic mayo from a jar with 1 clove of crushed garlic and the juice of half a lemon. Season with a pinch of salt and stir until smooth. Top with the zest of half a lemon for a bit of extra zing. Update: Make it vegan! My friend Kyra gave me a great tip as to how to make this meatless treat vegan-friendly: “Ener-g egg replacer works perfectly! But you can also soak flax seeds overnight and then use the goo as a coagulant.” Thanks, Kyra! I never thought of deep frying them. I have a can. I will have to give it a try. Thanks for sharing. I love artichokes so I will definitely try this recipe. Thank you for visiting my blog, liking my post and following. I hope you will keep finding my post interesting. I am glad you found me, so I found you! I have been searching high and low to find locally canned artichoke hearts. The ones in the store come from Peru, Spain, Ecuador. Do you have a brand name to recommend from California?